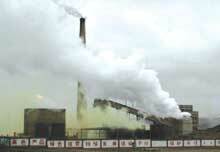 China has disclosed data pertaining to its greenhouse gas (ghg) emissions. The information was part of a report China Initial National Communication on Climate Change it submitted to the un F ramework Convention on Climate Change. China said it emitted 2.6 billion tonnes of carbon dioxide, 34.29 million tonnes of methane and 850,000 tonnes of nitrous oxide in 1994. More recent figures would be higher, experts warn. While China's per capita emission is low compared to other countries, the total pollutants it emits is the second highest globally. "The issue is not the number. The volume is increasing rapidly," says Khalid Malik, un resident coordinator in Beijing. Since China is the world's second largest energy consumer, its efforts to cut ghg emissions are crucial. The Chinese government has expressed a resolve to raise public awareness. But it has warned that actual reductions would not take place due to economic growth. " ghg emissions by China will definitely be much higher in the future," said Gao Feng, deputy director general of the foreign ministry's department of treaty and law.